Gordon sent in the results for his 2nd full winter of operation on his schoolhouse retrofitted to a VERY energy efficient home. Pretty impressive for a home in a tough Canada climate. 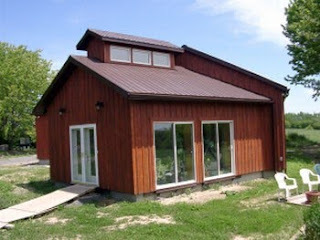 They did a very carefully designed retrofit that includes adding an R40 Larsen Truss for wall insulation, very efficient passive gain windows, a masonry heater, and a new solarium (shown in the picture) that provides solar space heating for the house. The house is beautiful inside and out. The home comes close to meeting Passive House Institute standards , and uses about 6% of of the energy of a similar size typical home in their area -- all in a retrofit!